and sounds, and offers multiplayer support as well. 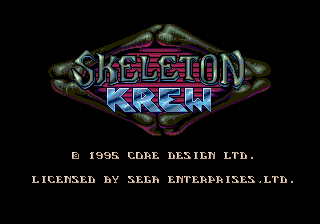 Skeleton Krew is a fun 3/4 perspective game in the vein of contra. It looks good, plays well ,and you get 3 characters to choose from! Definately play it with a friend. I give it a 9. Although it's fun in one player mode, with two players this game really comes into it's own! Superb fun! This is a great isometric shooter that you can play alone or with a friend. It is a bit repetitive but overall it ends quickly. Perhaps too quickly. I finished the game once solo and later again with a friend. I sold it not long after because I just had no more interest in it. Perhaps one of the things that makes it shorter than other games of this type is that it plays fair. Especially the boss levels, which won't have you tossing away a few lives just to get past them. A fun game, not frustrating at all, but probably too short for it's own good. 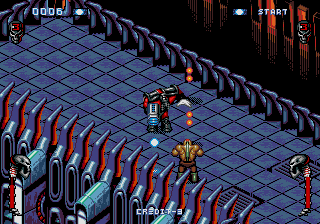 For more like this, try The Chaos Engine / Soldier of Fortune. Ha haa! 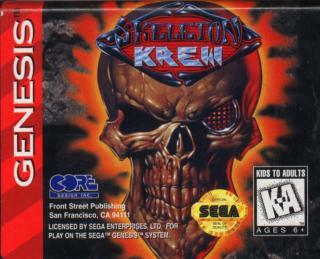 Theres absolutly nothing wrong with this game at all, a latter Megadrive classic in the vein of Chaos Engine or Loaded (something like that. It's a nice bit of shoot'em-up fun! After all, isn't that what games are about?